What to See in a Yangtze River Cruise? Of course the Three Gorges and the giant Three Gorges Dam! However, what Yangtze River offers are more than these. From Chongqing to Shanghai, especially the essential Three Gorges area between Chongqing and Yichang, you will have the chances to explore the historical and cultural sites, and witness the natural beauty of Gorges. Normally one shore excursion is arranged each day. But different cruises may have different itinerary. You can check your ship for its cruise route, or contact us. For your Yangtze River cruise shore excursion sites visiting, there are the arranged and optional types. The arranged shore excursions are included in your cruise fees, however, the optional ones need extra pay if you are interested to visit. Besides, the arranged and optional excursions are chosen differently by different cruise companies for upstream and downstream Yangtze cruise routes and the optional ones are charged variously. Let’s check the sites arrangements at below table for your reference. Check detaild 2019 cruise itinerary of Century Cruises. Check detaild 2019 cruise itinerary of President Cruises. Check detaild 2019 cruise itinerary of Yangtze Explorer. Check detaild 2019 cruise itinerary of Yangtze Gold Cruises. 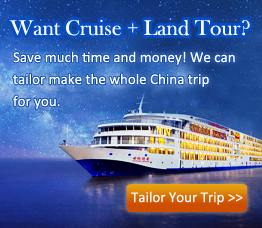 Check detaild 2019 Yangtze 1 cruise itinerary and Yangtze 2 cruise itinerary. 1. Charge for An Optional Shore Excursion: Victoria Cruises are for 295 RMB, except Quyuan Birthplace for 220 RMB; Century Cruises are for 290 RMB, except Quyuan Birthplace for 220 RMB; President Cruises are for 280 RMB; Yangtze Gold Cruises are 290 RMB for each one site per person, except Shibaozhai Pagoda charges for 220 RMB/person, Small Lesser Three Gorges charges for 150 RMB/person, Return to the Three Gorges Show for 320 RMB/person and Quyuan Temple charges for 220 RMB/person (180 RMB/person when visiting with the Three Gorges Dam); Yangtze Explorer are Baiheliang Underground Museum for 150 RMB, and Three Kingdoms Open Air Show for 290 RMB; Changjiang Cruises are for 290 RMB. 2. The optional excursion sites are arranged by Yangtze River cruise companies according to the amount of guests who want to visit the sites. You can visit the excursions if there are 30 or more people (the number for visitors may be adjusted based on the practical situation). However, if you are not going to pay a visit to the sites, you could stay onboard the cruise to enjoy the wonderful activities and lectures to spend leisure moments. Besides, to ensure your personal safety, it is not allowed to leave the cruise on your own during the excursion time.